Could You Be Fired for a Social Media Post? Hello! Nice inbox you have there. I brought that sweet, sweet class action news you ordered, and believe me, you’re in for a treat. Made fresh for you, we have information on troublesome Nutribullet blades, more aloe products that may not contain any aloe, and reports of companies violating job seekers’ rights when it comes to background checks. It sounds grim now, but not to worry! The friendly neighborhood attorneys working with ClassAction.org are looking to see if lawsuits can be filed to help people like you. Enjoy the news, savor the settlements and thanks for staying tuned. If you need me, I’ll be hanging out on our Facebook and Twitter pages. Bon appétit! A handful of new products have been added to an investigation into claims that some popular health and suncare products advertised as containing 100% (or at least a significant amount of) aloe don't actually contain any aloe - at all. Among the new additions? Target’s Up & Up Aloe Vera Gel, Walgreens’ Aloe Gel 0.5% Lidocaine Pain Reliever, Walgreens’ Aloe Vera Body Gel, Walgreens’ Advanced Hand Sanitizer with Aloe, Purell’s Advanced Hand Sanitizer Refreshing Aloe, Dollar General's Body Soothing Aloe Gel, Tropic Sun's Aloe Vera Gel and GNC's Aloe Vera Skin Gel. Whew, that's quite the list. 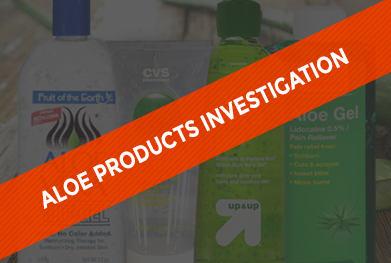 If you bought any of these products, the attorneys we work with want to hear from you. By talking to people like you, they may be able to gather enough information to file a class action against the makers of these products and help consumers get their money back. Check it out. So, there you are. You woke up early to get a head start on the day and you need something healthy for breakfast. What do you choose? A smoothie, of course! But just as you go to blend the perfect mixture of fruit, yogurt and ice – you notice that your blender blade is cracked! Well, that’s just what this next lawsuit is looking to fix. Attorneys working with ClassAction.org are investigating whether the blades in certain Nutribullets are cracking and breaking without warning. The Nutribullet Pro 900 was even listed as a “Don’t Buy: Safety Risk Item” by Consumer Reports. If this happened to you (I’m really sorry if it did), stop by this page and tell us your story. Fill out the form to help attorneys working with ClassAction.org decide whether a class action lawsuit can be filed on behalf of Nutribullet customers. Background: Check. Check. Is This Thing Legal? For the past couple months, we’ve been compiling information about your rights when it comes to background checks. As it turns out, employers have to meet certain criteria when running background checks on potential employees. Under the Fair Credit Reporting Act, for instance, job applicants must be informed that their potential employers are planning on running background checks. This disclosure must be in writing and can’t be hidden in the employment application. And, if an applicant doesn't get the job because of his or her background check, he or she must receive a copy of the report. Now, as you may have guessed, the attorneys working with ClassAction.org are looking to get in touch with anyone who was turned down for a job (or an apartment) because of their background check. Read up on your rights, get in touch, and you may be able to collect up to $1,000 in damages. Attorneys working with ClassAction.org have reason to believe that some supermarket managers are being cheated out of overtime wages. An investigation is now underway to see if lawsuits can be filed to help grocery store managers collect their unpaid wages. Publix, Fresh Market and others have already been sued for failing to provide their managers with proper overtime pay. If you’re a supermarket manager who was only paid half-time or didn’t receive overtime pay at all, you may want to check this out. Several healthcare companies and staffing agencies have been hit with lawsuits claiming that they failed to properly pay their travel nurses. Kaiser Permanente and AMN Healthcare are among those to have been hit with suits, which accuse the companies of forcing nurses to skip breaks and failing to pay them overtime. If you think you're being subjected to illegal wage practices and want to speak with an attorney we work with – or if you just want more information – stop by this page. Can I Get Fired for a Facebook Post? Have you ever wondered if a Facebook post or Tweet – righteous-indignation-fueled or not – could get you fired? Well, that’s exactly what we explored in this recent piece on our blog. From how it relates to your freedom of speech to the exceptions that could be made, we took a look at how any social media post could quickly change your employment status. Read on! Pokémon Go – A Wild Lawsuit Appeared! When the world of Pokémon meets the legal realm, there’s…well, not a whole lot of certainty. Lawsuits against the companies behind Pokémon Go are raising plenty of questions, if nothing else. Are Niantic and The Pokémon Company legally liable for harm caused by their app? Where does augmented reality fall under the law? Check out the thoughts we had here. I Got a Class Action Notice – Is This a Scam? By this point, you’ve probably received a letter or e-mail saying you’re covered by a class action and that you can claim some money through a settlement. Likely story, right? It has to be a scam, doesn't it? Well, as it turns out, probably not. A recent entry on our blog illustrates how lawyers know to send you a notice, why you can claim money even though you didn’t sue anyone yourself and other gems exclusive to the magical land of class action lawsuits. Read more here. Bayer Healthcare has slipped loose from the grip of a multidistrict litigation after a judge tossed 1,200 lawsuits claiming the company's intrauterine device Mirena injured patients. Bayer was granted summary judgment in the MDL, putting an end to the litigation before it went any further. Judge Cathy Seibel found that the lack of reliable expert testimony on the plaintiffs' side made it impossible to prove that Bayer’s device caused the injuries. It’s worth noting that the court barred their experts from speaking because they were, according to Judge Seibel, unqualified.